When you spend a lot of time in hospitals as a caregiver, you can go through many emotional phases simultaneously. In the past few years, dealing first with my grandmother’s medical condition and now with my mother’s, there have been days where I have felt like superman one minute – marveling at my own energy reserves, patting myself on the back for having juggled small and big problems in six different places at the same time – and then, the very next moment, like an enfeebled old man, wanting to be free of all responsibilities, unconvinced that I’ll ever be able to get up from the chair I have just sunk into. And then something new comes up and you’re smoothening your cape again and rushing to stop a wily doctor in the MRI room from repeating a procedure that had been done the previous day, while nurses and ward-boys giggle on the periphery of your super-vision. 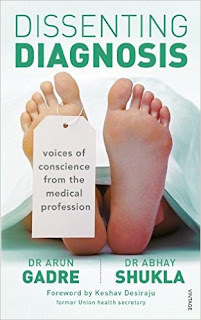 With many such adventures having accrued over the years, the new book Dissenting Diagnosis: Voices of Conscience from the Medical Profession – co-written by doctors Arun Gadre and Abhay Shukla as an attempt to record some of the ugly truths about medical practice in India – contained much that was familiar, giving me the shudders as well as the jollies. That malpractices in corporate healthcare have escalated in recent times will come as no surprise to anyone who has dealt firsthand with the beast; the subject has also been covered in investigative journalism and in books such as Rana Dasgupta’s Capital: A Portrait of Twenty-First Century Delhi, one chapter of which has the author in conversation with three caregivers about dehumanization in medicine. 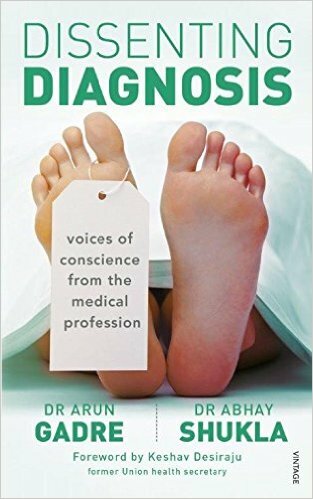 Dissenting Diagnosis, on the other hand, is an inside account, organised around the testimonies of 78 disillusioned doctors (nearly half of whom consented to have their names published) from across the country. It’s a well-organised book with predictable but to-the-point section heads such as “Diagnosing the Malady” and “Initiating the Cure”. You won’t read it for riveting prose or for a cleverly crafted narrative – many passages are simply made up of quotes by the participating doctors, placed next to each other, held together by some basic commentary, and some of this material is repetitive – but it has a raw, urgent directness that you might not find in a more polished work. The initial chapters contain information about things that most educated people have an inkling of: the nexus between pharmaceutical companies and corporate hospitals; the pressure on doctors to prescribe as many costly investigations and tests as possible, to earn a pre-specified revenue for their hospitals; the lack of transparency and the emotional exploitation of patients’ families in situations where every second counts and composed reflection isn’t possible. Included here are many little stories that should startle anyone who still holds a worshipful view of the medical profession. The one about a speed-obsessed senior surgeon, for instance, who accidentally cut a major artery during a routine kidney operation, consequently had to remove the entire organ instead of just the stones – and later told the patient’s family that he had executed a heroic last-minute turnaround because the kidney was damaged beforehand. Or the one about a hospital that hid a deceased patient’s body to put pressure on the family since they hadn’t been able to pay the full bill. There are also pointers to how advancements in technology and knowledge, welcome though they are, have had downsides, as all technology potentially does. The amount of material now available online – for patients and caregivers keen to do their own research – can be a double-edged sword (increased information about things like platelet counts, the authors say, can make people unduly alarmed about variations on test results, and thus vulnerable to avoidable prescriptions). The rise of pharmaceutical companies, which should be a good thing in principle, has resulted in excessive commercialization, competition and questionable promotional measures such as taking doctors on sponsored overseas trips. One minor problem with the book is that some of its observations are too abstract: vague-sounding statements about “cuts” or “commissions”, sentences that begin “A practitioner from a small town observes…” or “A big-city physician explains…” (The passages where doctors are named naturally feel more substantial.) At times, chatty stories pile up one atop another, and some of these can read like stray gossip which, even if true, adds little to our understanding of the big picture. I found it hard to swallow the idea that senior doctors mingling at parties would chortle about a new lamb being led to the slaughter – not because I think doctors are incapable of being malicious or greedy, but because in cases where individuals are mostly looking out for themselves and keeping their cards close to their chest, it is unlikely that dark plots would be discussed so openly or that they would mwa-ha-ha like 1970s Hindi-film villains. While much of the book’s first half reads like a litany of everything that is wrong, the second section discusses possible remedies, including the potential for measures such as the impossibly idealistic-sounding Universal Health Care, aimed at ending the commodification of healthcare. As the doctors themselves admit, there are many layers of problems and no easy answers. For example, it is undoubtedly true that some of the current ills of Indian medicine stem from the way in which a soft-socialist country made a (relatively) rapid leap towards privatization post-1991, and how the upheavals involved affected both medical education and practice, especially in cities and big towns. The authors are probably right that some aspects of healthcare (such as the proliferation of donation-based private medical colleges that produce young doctors who then need to “recover” their “investment” by falling in with corporate pressures) have not been well-monitored, and that the promises of self-regulation made by doctors in private practice have proved less than reliable over the years. Which raises the question: is increased government interference in private healthcare – one of the proposals made in the book – an unambiguously good solution? Well-intentioned though the idea may be, it can set off alarm bells in even those of us who aren’t fans of unbridled capitalism: it would mean moving down a very slippery slope – and in any case, who can ensure that a state-regulated system would be free from corruptibility? Given these difficulties, the solutions that I thought most persuasive weren’t the sweeping measures but the softer ones, such as the increase in and dedicated maintenance of doctor-consumer forums, and the spread of awareness through education and social action – and of course, through books like this one. Its closing passages provide many useful tips for concerned citizens, including lists of websites and information about organisations such as the policy-advocacy NGO SATHI, which the authors are associated with. A favourable prognosis may be a long time coming, but such initiatives should help make a dent in a hardened, often-impersonal system. This is the first time I'm commenting on this blog, although I've been a regular reader for years. I'm a fourth generation doctor, strange as that might sound. So I've grown up hearing about how the system is getting worse and worse. Despite that pedigree, however, I find that I'm painfully naive about the "real" health system, outside the government sector cocoon I've been in until this time. However, from listening to the lore, and hearing from friends who are in the business, it doesn't seem as if the problem is of corruption/venality as much as a systemic contagion of non-accountability. The increased awareness (and litigiousness) of patients hasn't resulted in systematic attempts to be more accountable; instead, doctors have now learnt to record one thing and do another; to close ranks while dealing with crises; to assume that the doctor-patient relationship is necessarily an antagonistic one; and to be massively paternalistic while dealing with patients/caregivers. None of these problems are new; some doctors admit to it, others will justify these attitudes with a hundred anecdotes about semi-informed patients, irrational court rulings and biased media coverage. A very small minority thinks that this is unequivocally the right way to be. that's my experience, at least. My impression is that the 'halcyon days' were the ones in which doctors were noble/sarkari/self-abnegating, but healthcare was available to a really tiny minority, either the urban or the well-to-do. like all other things in India, access has increased over the past 25 years, but costs have increased, and quality has decreased. 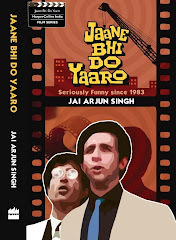 and because doctors are no longer mai-baap, we're willing to talk about how awful they can be. Hi, thanks so much for commenting - this is most interesting, and it makes sense. As I have indicated (in a small way) in the post, I'm a little suspicious of the concept of "halcyon days" anyway: it often seems like a subset of the larger, golden-ageist line that goes "the old days were so much better/more refined". And it probably is true too that the increase in access (which in itself is a good thing) has "freed" people to criticise doctors. So much more to say on the subject, of course. Would it be okay if I shared your comment on the Facebook post where I have linked to the review? Existing state of affairs cannot be merely attributed to doctors . In the present times name one who is not fond of a higher pay package. But it becomes unethical when wrong doing is promoted to make money. Its equally important to understand that every doctor is not fond of going into corporate or private practice but he has no choice as government job is not going to pay him as much or be more satisfying as resources are inadequate for clinical practice in a government set up. The reason for monopolization of private sector is also this. Above all who is supposed to prevent quackery in medical profession. If quackery is controlled it will do some good as the cost of treatment and consultation may come down due to adequate patient base available for private practitioners. If every business runs for profit why not health care.. A patient is happy to spend 2000 rupees on dinner and outing but needs tremendous guts to pay off the same to a doctor for his own health. There needs to be a balance between money, minds, ethics and government machinery to do away with wrong doings in the system. In fact the failure of public sector to deliver always promotes private sector. If a minister falls ill in Delhi why is he rushed to AIIMS but not to Deen Dayal Upadhyay hospital... ? ?